Research from OMRF has revealed new findings on the effects of obesity and on fat tissue in the knee joint in the formation of osteoarthritis, the most common form of arthritis. Osteoarthritis, or OA, is the most common form of disability in the U.S., affecting nearly 27 million Americans. It occurs when the cartilage that cushions bones in the joints breaks down and wears away, leaving the bones to painfully rub against one another. This is most commonly found in the knees, hips, fingers, lower back and neck. 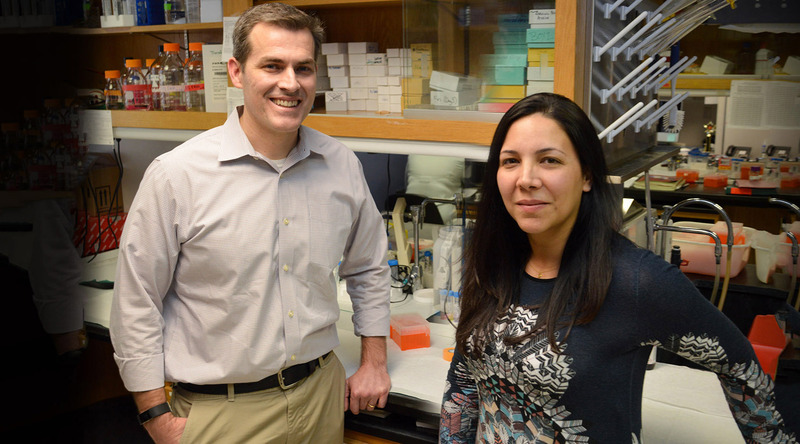 To better understand disease onset, OMRF researchers Tim Griffin, Ph.D., and Erika Barboza Prado Lopes, Ph.D., looked at fat tissue in the knee joint known as the infrapatellar fat pad. Their research centered on whether a high-fat diet causes the fat pad in the knee to become inflamed, which then contributes to the formation of OA. In order to find the answer, the scientists took a step back in the research process. Griffin said they already knew they could feed mice a high-fat diet and cause OA of the knee. But they needed to study what happened in the fat pad under the conditions of a high-fat diet before OA develops to know if it could be causing the disease. This study, Griffin said, was one of the first of its kind to look at the fat pad in a pre-disease stage. The researchers made an unexpected discovery: Obesity increased the size of the knee fat pad without causing it to become inflamed. Because the fat pad in the knee did not become inflamed with the high-fat diet, the researchers do not believe it is initiating the increased risk of OA. But it may still play a role in overall joint health, said Lopes. The new findings have been published in the journal Arthritis & Rheumatology. OMRF researchers Florea Lupu, Ph.D., Susan Kovats, Ph.D., and Rheal Towner, Ph.D., also contributed to the research, which was supported by grants from the National Institutes of Health (numbers P20-RR-018758, P20-GM-103441 and R03-AR-066828) and the Arthritis Foundation.